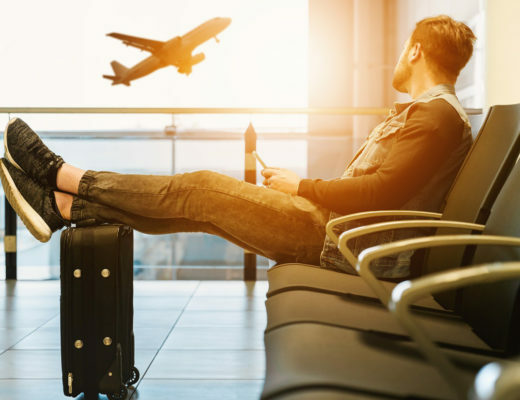 Whether having a short or long layover at the San Francisco International Airport, a transit passenger will never have a dull moment as the airport has a wide assortment of amusing things to make the wait so much bearable. From interesting art galleries to sumptuous food, the airport’s features will definitely make anyone want to stay for more. On the other hand, transit passengers having more hours to spare and prefer to leave the airport to explore the city will find the Inner Sunset District just south of the Golden Gate Park a wiser option for sight-seeing. The Inner Sunset District may be lesser known among the other districts in San Francisco, California (not as widely popular as the Chinatown, Haight-Ashbury or Fisherman’s Wharf) but it packs a lot of charm worth everyone’s visit. 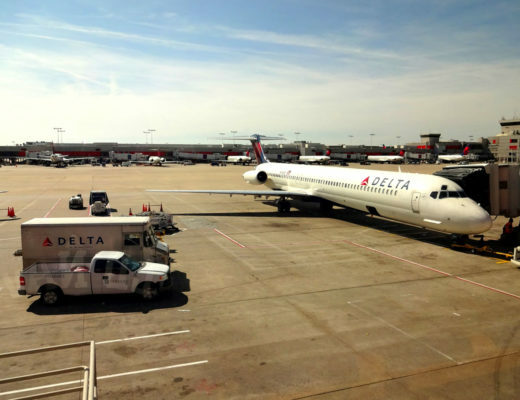 This is part of our Airport Layover Series, a collection of destination guides perfect for short day trips and uniquely catered for travelers seeking to make most of their long-haul airport layovers. 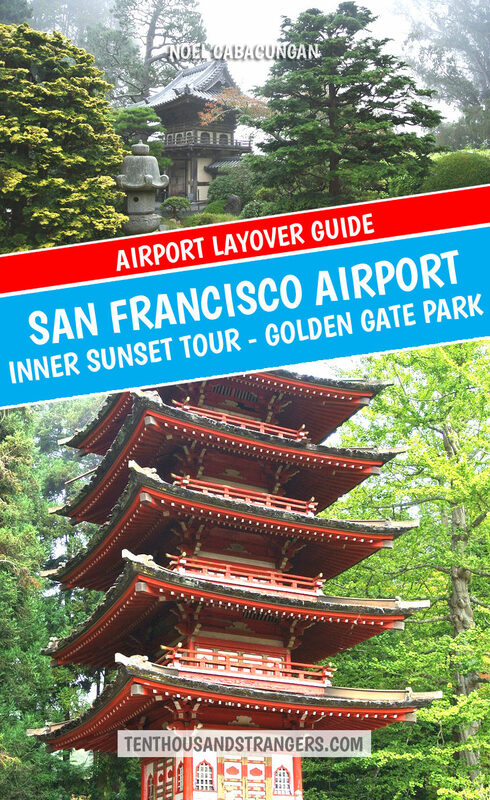 The San Francisco Airport Layover Guide – The Inner Sunset Tour is a guest post from Journey, a curator at Locaux! Locaux!, a site dedicated to sharing the stories of women expat entrepreneurs, and Locaux Insider Travel Guides to your favorite cities around the world. If you’re traveling solo or as a couple, and have a 24 to 48 hours layover while traveling in the U.S., specifically in San Francisco, California, the following is a great way to consolidate your time and take in the best attractions Golden Gate Park offers for a short but full and satisfying visit. Golden Gate Park ranks in the top 100 largest city parks in the U.S. That said, not only is it lush with loads of nature and greenery, but also one of the world’s great tourist destinations. The park is full of variety, but on this trip, we’re focusing on the main attractions in the Inner Sunset District section of the park. All are situated in close proximity to one another. 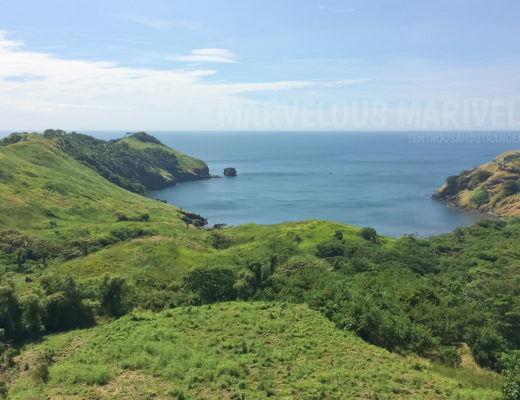 So you can plan to have a full day enjoying these sites without tiring yourself running about the city. 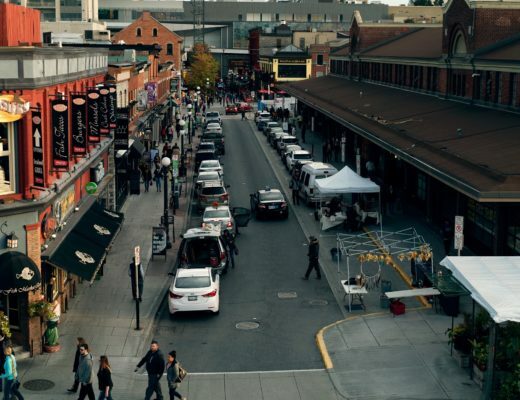 And even though you’re not staying long, you’ll get a nice taste of the city vibes, especially if booking your accommodations in the heart of the city. Note: Lodging at any place convenient to Market Street works well for day or night strolls along this main street, the day you arrive or after enjoying the activities in the park. And also, the train from and of the close stations will help make your visit less complicated. Keep reading for full details about these attractions below. 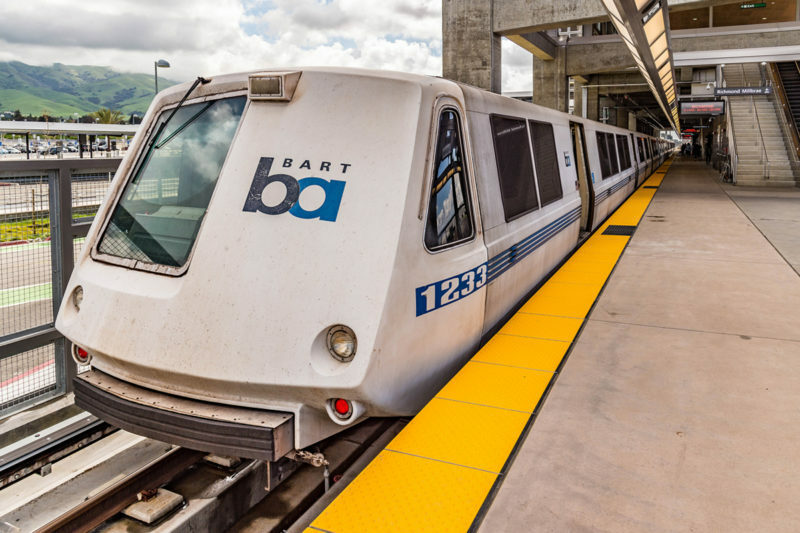 From the San Francisco International Airport, you can conveniently hop the public transit train BART (Bay Area Rapid Transit), from the Millbrae Station heading north into the city center. Given the station is connected to the airport, using BART to travel from the airport is a sensible solution, because you never have to exit the building. The ride into the heart of the city is about half an hour long. However, allow an hour for an end-to-end trip, including time purchasing tickets and wait for train arrival. Note: BART fares are based on the distance you travel. This means you must know your departure station before buying your ticket. Call ahead to the place you’re staying to ask the closest stop. Once you have that, you will see it listed on a tiny map on the ticket machine, on one of the wall maps near the entrance, or ask an attendant. When at the ticket machine, you will see a list displaying the current fares posted. Locate your destination station, which will likely be Civic Center, Powell, Montgomery or Embarcadero, if you’ve booked to stay in the heart of the city. Though you can purchase multiple tickets at the same time using cash, credit or debit cards, understand each person must have their own ticket. Once you have the right amount, print your ticket(s). Note: The list of stops are neither alphabetized nor in the order they travel along the line. The default amount for each ticket you’ll see is $20, but you can change that by using the keypad buttons that let you add or subtract until you get the exact value. There is no need to have more money on a ticket than you can use. 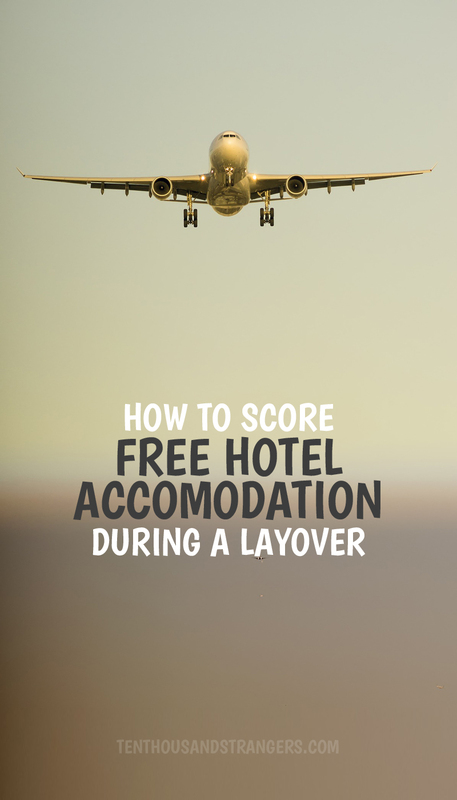 However, you may consider and can purchase to have your trip back to the airport initially. 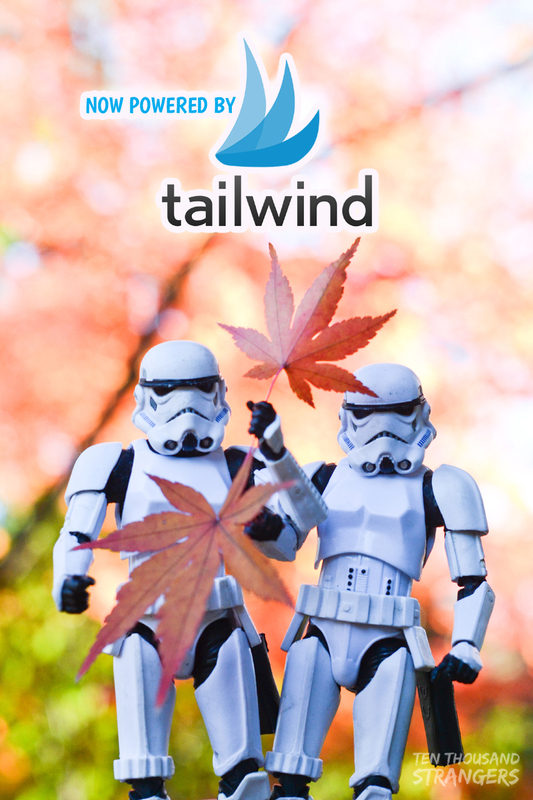 Be mindful to keep track of your ticket. You won’t receive a refund or credit if it’s lost. 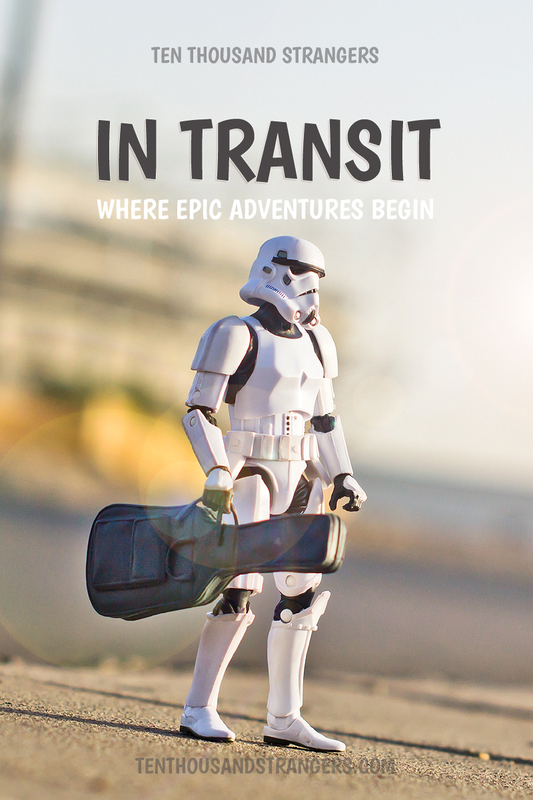 Once you’re ready to visit the park, simply catch the Muni (The San Francisco Municipal Railway) Bus 7 Haight from downtown, in the direction of Ocean Beach. You will off-board at 9th Avenue and Lincoln Way, near the Botanical Gardens. Don’t worry. This is a main stop and bus drivers are extremely helpful. So you won’t miss the stop if you let them know you are heading to the park, they won’t let you miss it. Note: This route is nice because it takes you through another famous part of the city: The Haight-Asbury District. You know, the area made famous by the rebellious hippie flower-power children of the 70s and band The Grateful Dead. Technically, you could hop off here and buy lots of tie-dyed clothing. But why? Save experiencing this bit of history until your next visit. Once off the bus, you’re in the park. You will see the entrance to the Botanical Gardens to your left. As you take a short walk deeper into the park you’ll come to the other points of interest. 44 O’Shaughnessy Bus. Stops at the Tea Garden inside the park. 5 Fulton Bus. Get off at 8th Avenue, walk into the park. You’ll see the de Young Museum. From Fisherman’s Wharf. Take the F-trolley to Market Street, then the N Judah streetcar (underground Muni train) to 9th Ave. Walk into the park on 9th. From Downtown. Go into one of the downtown Muni stations (underground Market Street) and catch the N Judah train. Get off at 9th Avenue, walk into the park on 9th, then right on Hagiwara Tea Garden Dr.
A major cultural destination since 1895, the De Young Museum reopened in October 2005 in a facility designed by Swiss architecture firm Herzog & de Meuron and Fong & Chan Architects in San Francisco. The museum houses the world-renowned American Painting and Sculpture collection, dating from the 17th to the 20th Centuries. Primitive Art is highly represented with extraordinary pieces of Native American Art from the ancient Teotihuacan City, African and Oceanic Art. The façade of the building is made of perforated and embossed copper that complements the lush greenery around the museum. From the observation tower, you’re treated to an expansive view of the massive, open, airy park. 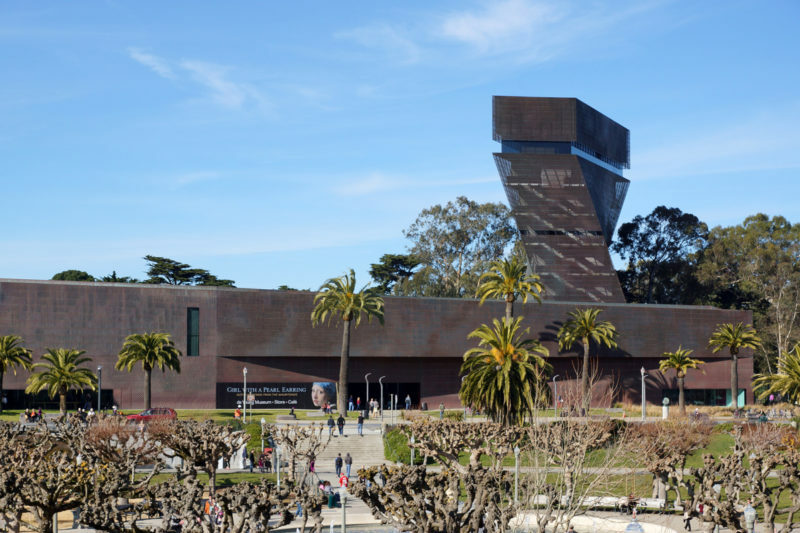 Note: If you’re visiting San Francisco on a first Tuesday of the month, enjoy free admission to the museum. 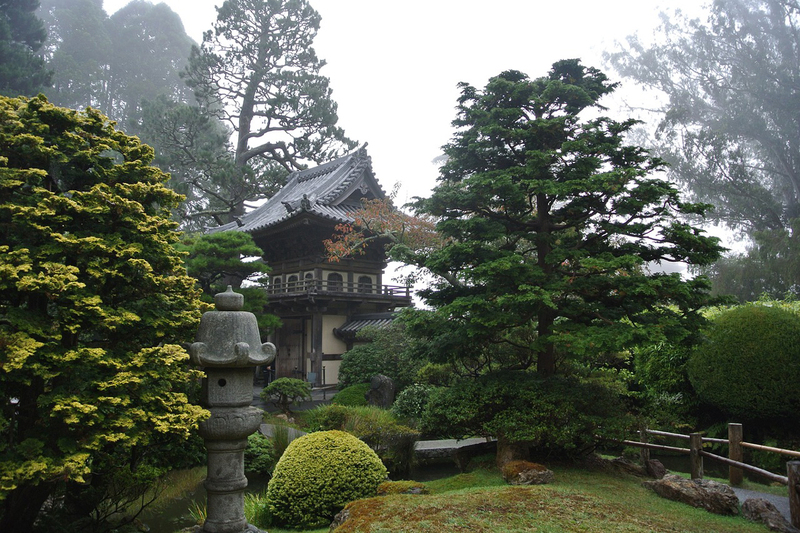 The Japanese Tea Garden, the oldest public Japanese garden in the United States. The Tea House is nestled in the center of The Japanese Tea Garden and overlooks the surrounding landscape and South-facing koi pond. After exploring, you can savor a meditative cup of tea, and sampling of popular Japanese refreshments, in the newly refurbished Tea House sitting around the custom-designed irori or farmhouse style family table. According to family members, Mr. Hagiwara introduced fortune cookies to the United States from Japan in the 1890’s or early 1900s. Initially, the cookies were made on site by hand using a special iron mold or kata. When demand grew, Mr. Hagiwara hired San Francisco confectioner Benkyodo to produce the fortune cookies in large quantities. Original fortune cookies made in Japan were savory rather than sweet, and it is believed that Benkyodo developed a vanilla recipe for Mr. Hagiwara to make it more appealing to Western palates; the flavor that is now popular across the U.S.
For more visitor information visit Japanese Tea Garden website. When to Go. Although you may visit year round, sunny days are the best time to go because it should be warm enough to enjoy the stroll through the gardens. The absolute best time to visit is when the cherry blossoms are blooming during March and April. Note: The teahouse is an open-air building, and because there are no walls, the temperature will be the same as the outside. Golden Gate Park is situated in part of the city that can be foggy, so visiting during May, June, July (fog season) may be a bit gray and damp. Winters here aren’t terribly cold (the normally mid 50’s), so it’s best to dress in layers with a light jacket. Time of Day to Go. Afternoons tend to be the most crowded. However, if you avoid the lunch hours between 11:30 to 14:00, the wait for a table at the tea-house should be tolerable. 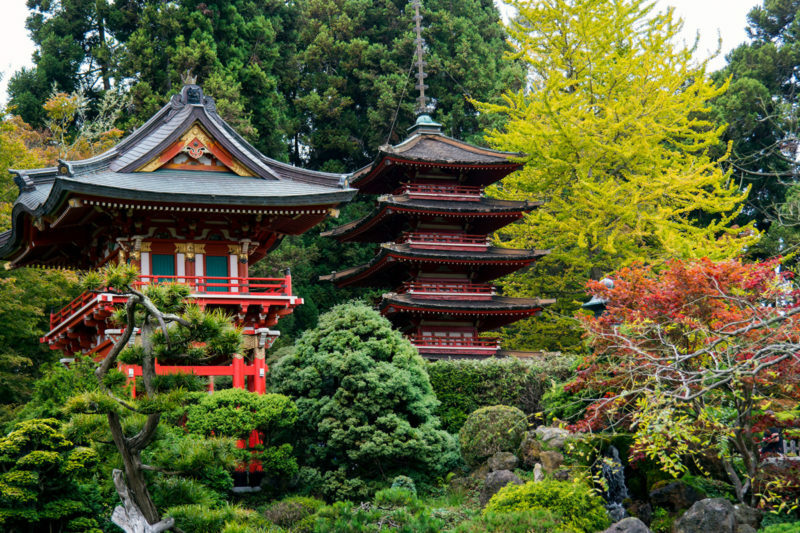 Take a Free Group Walking Tour of The Japanese Tea House. SF City Guides Free Walking Tours of San Francisco Our free regularly scheduled tours are open to the public. Donations are welcomed! Join us for a stroll through this five-acre world-famous garden. Learn about the icons of the Garden and the family that lived there. If you’d like to join a free walking tour, plan with SF City Guides. Note: Admission to garden required except on the Monday and Wednesday 9:30 morning tour. 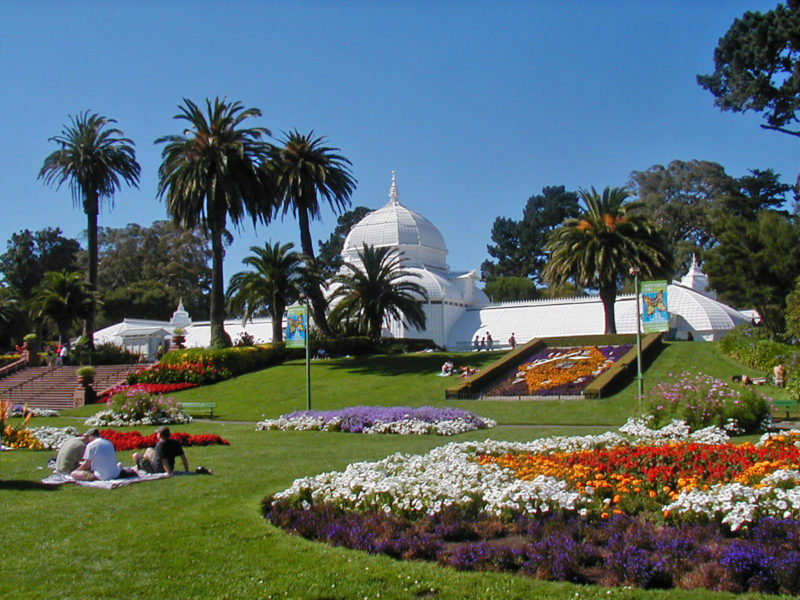 The San Francisco Conservatory of Flowers is an elaborate Victorian greenhouse botanical garden that houses a collection of rare and exotic plants. The building sits atop a gentle slope overlooking Conservatory Valley. Construction of the greenhouse was completed in 1879 and thus makes it the oldest building in the park. It has a central dome rising nearly 60 feet high and arch-shaped wings extending from it for an overall length of 240 feet. It was one of the first municipal conservatories ever constructed in the United States and is the oldest remaining municipal wooden conservatory in the country. As a result of these distinctions, and for it’s associated historical, architectural, and engineering merits, the Conservatory of Flowers is listed on the National and State Register of Historic Places. It too is registered as a California Historical Landmark and a San Francisco Designated Landmark. The mild temperatures, wet winters and dry summers of the Bay Area, coupled with San Francisco’s coastal fog, provide a range of climatic conditions that exist in few other botanical gardens in the world. These unique conditions allow it to grow and conserve plants from all over the globe, including plants that are no longer found in their native habitats. With its unique microclimate, the San Francisco Botanical Garden is able to recreate conditions of the high elevation tropical cloud forests of Central and South America and Southeast Asia. 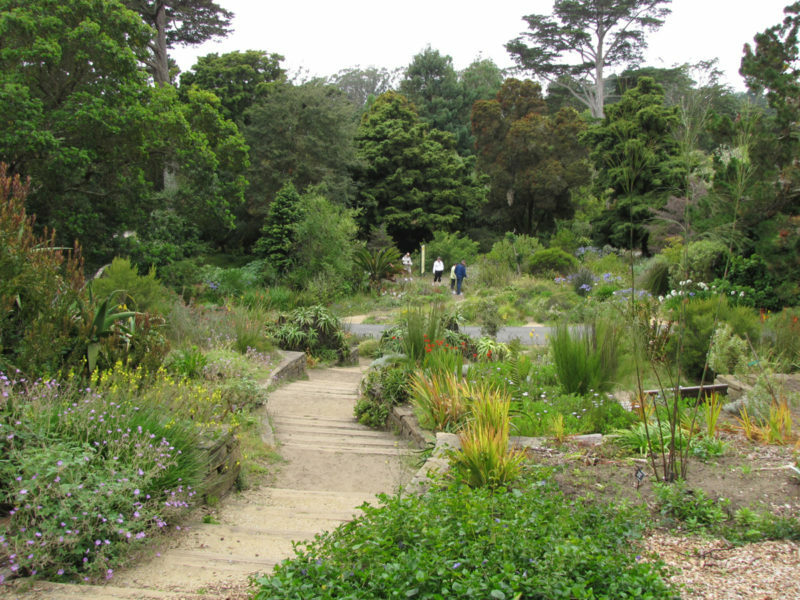 Largely due to these natural advantages, San Francisco Botanical Garden is known for its unique, diverse and significant botanical collections. The extensive Magnolia collection, for example, attracting visitors with its dazzling display of winter flowers, is recognized as the world’s fourth most significant collection of Magnolia for conservation purposes, and the most important outside China, where a majority of Magnolia species are found. 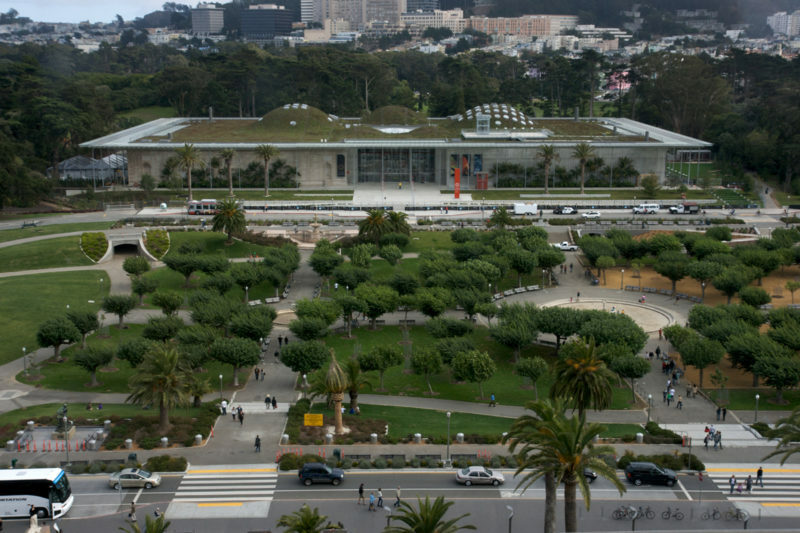 Located in Golden Gate Park, the California Academy of Sciences is one of the greenest buildings in the city. It boasts a platinum certification from the Leadership in Energy and Environmental Design (LEED). The museum features the Steinhart Aquarium, that’s complete with a hands-on tide pool and well-known alligator swamp. Other exciting features are the Morrison Planetarium, the four-story rainforest dome, and the Hall of African Mammals. In addition to these educational gems, the museum features other natural history exhibits as well as exhibits about global warming. The Academy Cafe offers international cuisine, while the elegant Moss Room restaurant is the only dining option available in the park past museum closing time. Note: If you’re in the city on a Thursday night, the Academy hosts Nightlife, with special lecturers, DJs, cocktails and mingling for adults age 21+. Although you can dine at the museum or academy, there are several great locally owned restaurants all over the city. 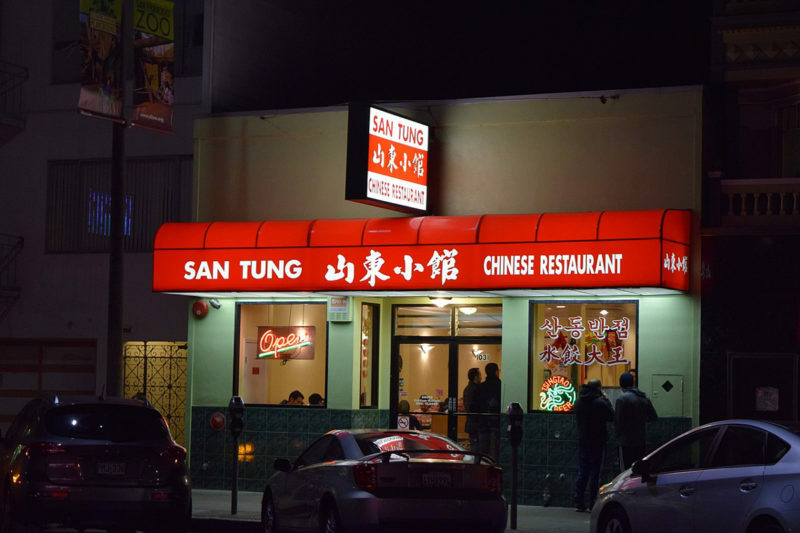 One that mustn’t forego being mentioned is an absolute favorite among locals: San Tung. Famed Dry Fried Chicken Wings (can be ordered boneless as well), handmade noodles & other Chinese eats in a no-frills environment. All food is freshly made to order. 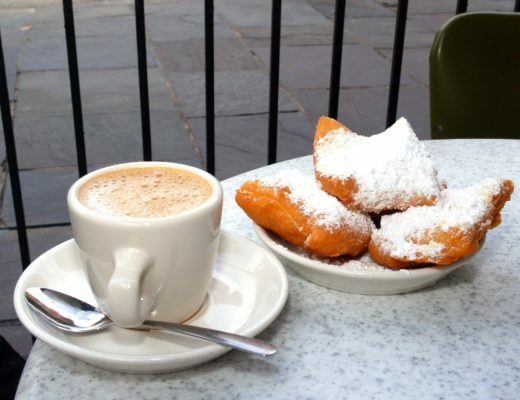 Go forward and indulge! Note: Fair warning. Due to the great food, San Tung is quite popular. There may be a wait, so plan accordingly. San Franciscans have no issue waiting in line for a table. You won’t regret dining there.